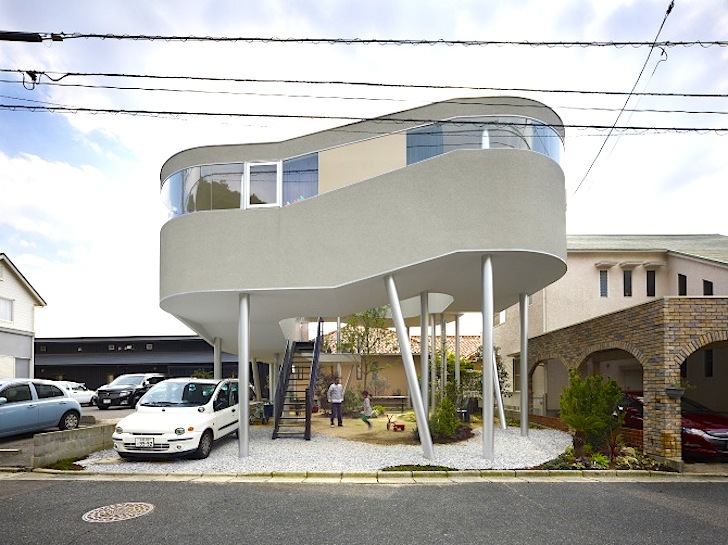 The Toda House is an unconventional residence perched high on stilts overlooking Hiroshima in Japan (which is also home to such avant garde architecture as super skinny houses, houses with climbing walls inside and homes shaped like pie). Tasked with ensuring that his client would have a view over the neighbor's roof, Kimihiko Okada lifted this multi-level platform home right up off the ground and stacked it on sturdy angular poles - giving the home the ultimate tiny footprint. Learn more after the jump and be sure to take a peek at Toshiyuki Yano's beautiful images of this incredible home. The Toda House consists of one continuous wraparound volume that is cloaked in a panel of well-insulated glass. This affords the home not only the view, which is enviable enough, but also plenty of daylight. 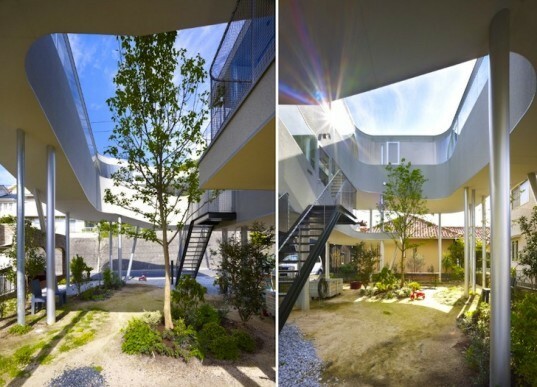 This dynamic structure with a gaping courtyard in the middle also ensures that plenty of natural ventilation is able to circulate throughout the 374 square foot residence. Although the home rests against a lush hill and maintains a direct connection with nature, it also functions a bit like a nest that provides ample protection from the elements. In addition to giving the project a negligible footprint, the lift also maximizes green space. Cars and bicycles can park below the home, and there is room for expansion – something that is definitely planned for the future. We really love the fluidity of this space and the modestly-furnished interior, which is positively flooded with natural light. Unbelievably, this home has only 374 square meters of floor space, which is ample when framed in this way!